BHARTIYA Electric Tube Expansion Drive Unit is governed by a separate Electric Control Panel which is adjusted by a simple Digital Display. When the Electrically Driven Motor reaches the desired Torque, the Control unit Mechanism automatically shuts off the Power and on pressing the Reverse Button the Tube Expander retracts out from the Tube. The Fully Automatic system ensures the Tube are rolled to maximum tightness without excessive cold worked stress in Tube Metal which prevents injuring Tube ends or distorting Tube Sheet Ligaments. 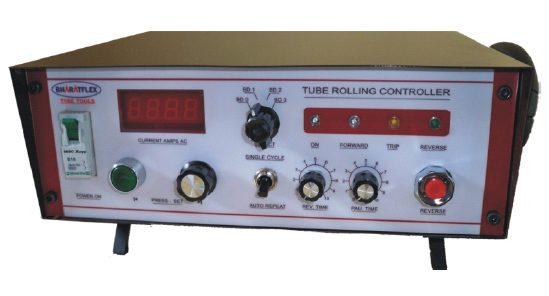 Note : Latest Design Highly Advanced - Micro processor based torque control unit- Also available - quote on request.